Dissolve cornflour in 1/4 cup milk and keep aside. Pour the remaining milk,condensed milk ,and sugar (if using) into a heavy bottomed pan and bring it to a boil,stirring in between. Pour the cornflour mixture into this .Stir well until it turns thick. Add cardamom powder and chopped pistachios, Switch off the stove. Allow it to cool. Pour the milk mixture into kulfi molds or Popsicle molds,cover with a foil and freeze for 3 to 4 hours.,remove from freezer and insert Popsicle sticks and freeze until firm. my fav super and yummy tasty kulfi.. Awesome pictures, I like the way you have garnished with the mint leaves and pistachios..
Super tempting kulfi !! love them !! gorgeous clicks !! wow, superb kulfi and they look so yum...lovely clicks.. Superb superb clicks & presentation and my most fav dessert! I love the way u have written the recipe inside a pic...like reading frm a magazine....Good job girl...way to go! the kulfi is a killer looks amazing!! Who got to eat it all?? ummmm.. love your clicks. Amazing! These mango kulfis are a virtual feast to the eyes. Lip smacking pics that speaks volume. Got to gear up for the summer soon. Gorgeous pictures, and the recipe card is simply awesome! omg! i love the picturesss! seriously.. i am trying real hard here to not think about kulfi! 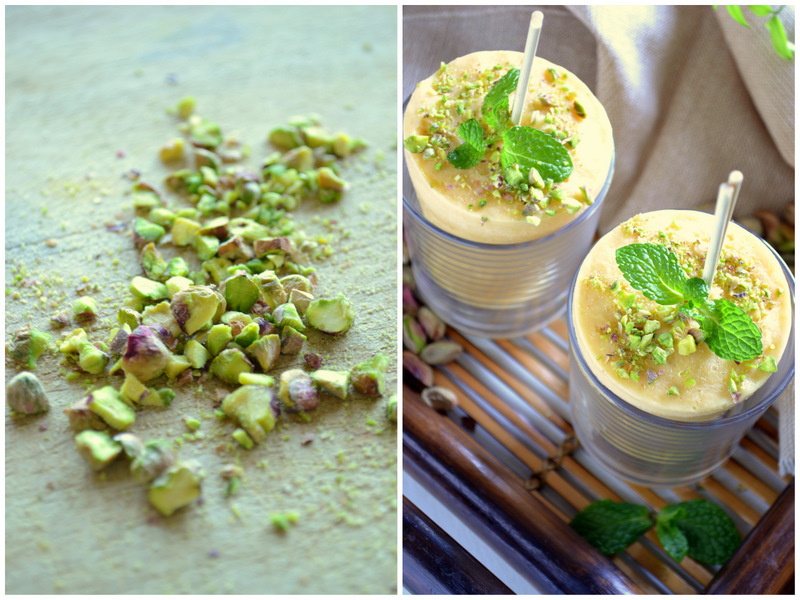 :)) love those pistachios and the recipe card and the first picture is just absoluuuteely gorgeous! looks chilled n yummy...bookmarked.....awesome presentation......nice space vth tasty recipes and nice cliks too.....happy to visit here.. visit me in my space when u find sum time..
wow...mango kulfi looks so so delicious dear.....loved the presentation n amazing clicks !wonderful ! wow!! super delicious mango kulfi and so tempting and beautiful clicks..loved it.. Looking forward to trying this recipe but wanted to clarify. By "corn flour" do you mean corn meal or corn starch? Thanks!